Criticism of our elected leaders typically vacillates between two themes. At times they are framed as completely incompetent, others as evil geniuses with a master plan. Conventional wisdom says they can’t be both, but how can you tell if it is either? Luckily one leader is not nearly as hard to understand. 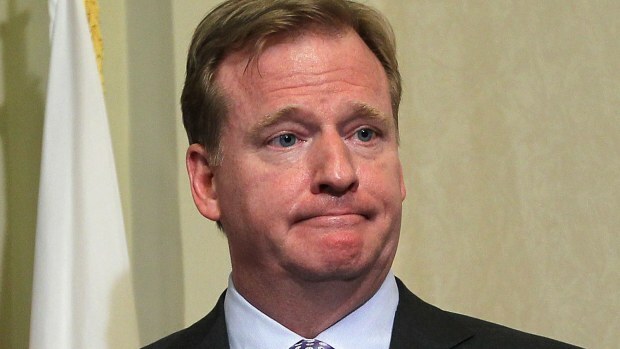 For NFL Commissioner Roger Goodell, his repeated failures have taken “evil genius” completely off the table. There is no debate, there is no master plan, only ineptitude. Sadly his track record also points to an additional character flaw– spite. Mounting evidence shows a pattern of behavior, a conspiracy and a massive ax to grind. His target, Twin City football fans. In making the case for a new Vikings stadium, Goodell touted the $1 million per year visiting teams pay in income tax over the course of a season of home games as well as the millions in “fall-out” revenue to hotels, restaurants and game day workers. He bloviated on endlessly about the financial impact to a community for even a single home game all while threatening “serious consequences” if we didn’t build him a stadium. He then turned around and shipped a Viking home game off to London in 2013, presumably robbing our fair state of any of that money– killing the cash cow he had been flogging for years. All to deliver our beloved sport to disinterested foreigners who think football is a boring game played with your feet. Strike one. Last year when Adrian Peterson’s horrific misdeeds came to light, Goodell served as a one-man wrecking crew, delivering an indefinite suspension by placing the player on the Commissioner’s exempt list. This was wholly appropriate given the troubling circumstances surrounding Peterson. But one piece of the equation made absolutely no sense. The suspension served while on this list was WITH PAY! Who exactly was being punished in that scenario? When a player stays home, saves his body from injury and collects his cash, he’s not feeling any pain I can assure you. So that leaves only one familiar victim of the punishment — THE FANS. That brings us to the latest slap in the face, one that is coming in just a few short days. It is almost time for the Vikings 2015 season opener. Normally a good time to brew up some chili, gather the family and enjoy the game. But a certain spiteful dictator has taken it upon himself to make sure as few fans as possible are able to enjoy that fine tradition. He’s buried the game on cable and slated kickoff after 9pm on a school night. It is the latest start time for any NFL game all season, and it is being inflicted upon our beloved purple. Football-starved youth will be forced to go to bed hungry, or stay up until early Tuesday morning to watch their favorite team. Academic performance and metro area teachers’ sanity will almost certainly suffer. Why does it make sense for a Midwestern team to travel that far, play that late, and have the shortest week two game prep possible? It defies logic and buzzkills every purple backer in the Central time zone and is just the latest example of an out-of-control Viking-hater-in-chief, doing his best to sabotage an entire fan base. Tell him to come clean, acknowledge the obvious and finally start wearing his cheesehead for all official league business. Shame on you Roger, we know what you are and the American people deserve better.